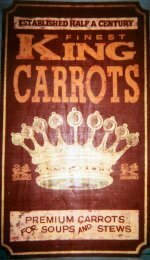 Jeff Chiplis, world renowned found and recycled neon artist from Cleveland, Ohio must lay claim to the title "Carrot King". 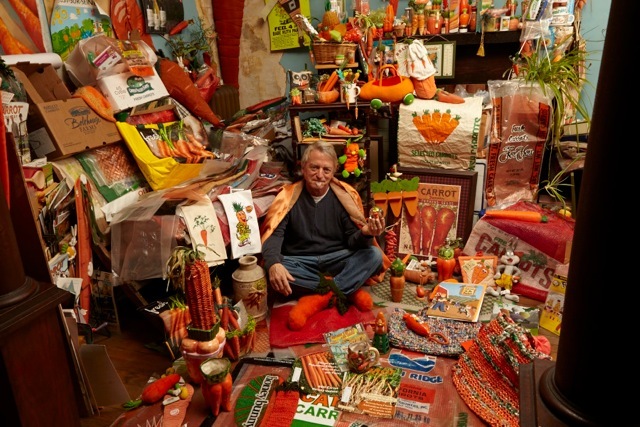 For over 30 years he has collected carrot bags simply because he likes the graphics. He started the collection when he noticed the graphics on a carrot bag in a grocery store in Indiana and found it interesting. He ate the carrots and taped the bag to his fridge door, before too long his door was covered with souvenir bags and the rest as they say is history. Many hundreds of carroty items festoon the walls of his collection, which is a wonder to experience. like many of the collectors he treasures many custom made items which fellow artists have created. 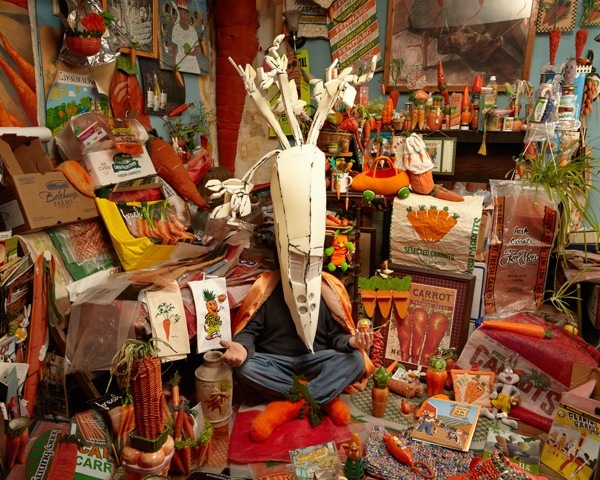 And of course the World Carrot Museum is glad to contribute unusual carrotabilia! Also a short Youtube video scanning around the carrot room here. Check out Jeff's fabulous neon art here. Here is Jeff showing off the current collection and a superb carrot mask. (Artist/mask maker yuko oyama, and becky yee, photographer - web site here). His collection has come from far and wide, he even roped in his sister who had to explain to an Argentinean market seller that she only wanted the bag and not the contents. Jeff has several bags that display a rabbit which bears a significant resemblance to Bugs Bunny. Although the true carrot collectors motto still holds good for the majority of the collection - "Less Cutesy - More Carotty!" The oldest label in the collection is for Howdy Doodie carrots dating from the 1950's. The mainstay of his collection are plastic and burlap bags. Jeff says "What's nice about the carrot bags is you can fold them up and put them under your arm and go places with them." Anything which is compact, easy to collect, easy to transport, and a wide variety is the ideal collectible. Carrot bags also mail well. A local woman who had seen Jeff on TV once sent him about 80 bags, ironed and folded. She had saved them for years under the sink, storing them in her rag bags. Jeff's total collection carrot memorabilia totals over 10,000 with items such as comic books, cartoons, kitchen tools and carrot gardeners row planter markers. He has toys, tee shirts and a carrot fishing fly! The list just goes on and on ... Christmas Tree decorations, plates, cups, fridge magnets. Jeff's carrot outreach also includes crashing neighbourhood Easter Egg hunts. He shows up anonymously, in a full-length foam rubber carrot suit, muscles in beside a bewildered Easter Bunny, and gives carrots to the kids. "They're healthier than candy," he says. The kids seemed to take to the idea, he says. "I think they just see it as a big carrot. I think they made the connection." Jeff's wife, Cindy, is a social worker who "definitely sees things as more carrot than cute." When they married, they hired a Buddhist minister who converted to Judaism at the last minute and couldn't officiate. But they found a Unitarian minister willing to read lines like "If you carrot all about each other . . .," and the ceremony went on without a hitch. Love crunches all. Jeff truly reflects the essence of carrot madness. Well done Jeff. 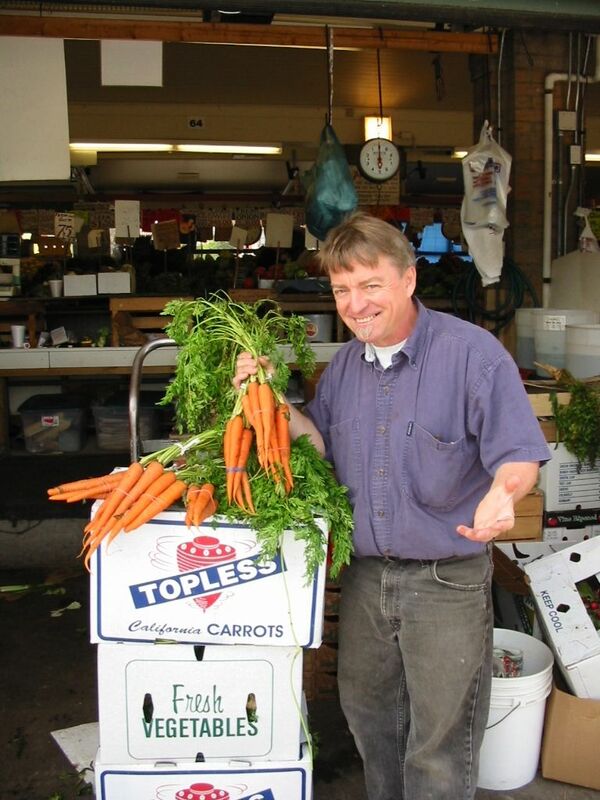 Jeff, the Carrot King, really is a man in touch with his roots.